Since 1989, Franz Strohmeier has been making the traditional Schilcher rosé with the Blauer Wildbacher grape. Beginning in 1990, he started experimenting, creating first a Schilcher red wine, and then his renowned Schilchersekt (sparkling wine). His philosophy was shifting away from his father’s, and in 1998 he left his family’s estate and together with his wife, opened his own winery. 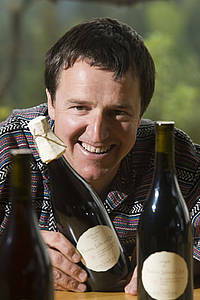 Since 2003 they have been cultivating the wines bio-dynamic methodes. In 2009 the first TLZ-wines (“Trauben, Liebe und Zeit” = “Grapes, Love and Time“) were produced on the basis of 2007 vintage. They are wines without sulfur or any additions. The name already characterises all “ingredients” necessary for the wine production. It is the quality of growth in the vineyard, which forms these wines. The Schilcher sparkling-wines as well as sparkling wines of Weissburgunder and Sauvignon Blanc are also made in traditional bottle fermentation without additions and fermentation yeast.